A great night was had by all 11 tables in last nights table quiz with a little something for everyone, both young and old. 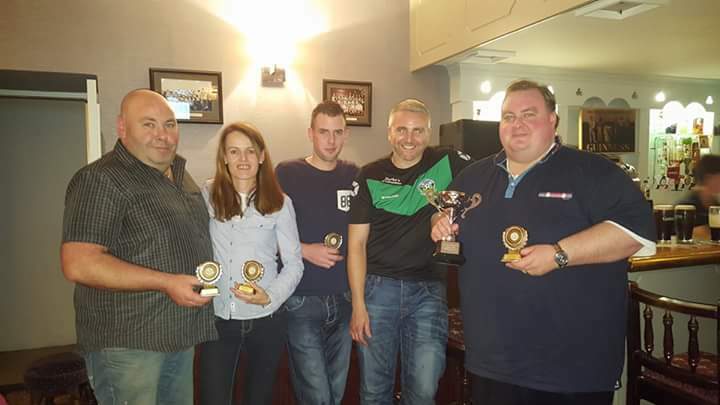 Well done to Kieran and Niamh O’Connor, Steven Broderick and Johnny Quigley who came up trumps on the night. They’re touring the parish at 5pm with the coveted cup; anyone available to light bonfires and send them their well wishes while on their tour, please do so!! Thanks to Linda Mannion who did a fine job as MC and to Ross Sullivan, Orla McCaffrey and the Burke ladies who set the questions. Thanks to Frank & Bernie Burke who generously sponsored the winners prizes. Well done also to Katie Coppinger who won top raffle prize of a 4 ball scramble in Ballinasloe golf club; Charlie Porter and Joe Fahy were the other major raffle winners. As part of Burkes bar’s 127th Anniversary celebrations festivities continue this evening with the bubble soccer tournament from 4-6pm, there should be an added dimension if this rain continues!! !